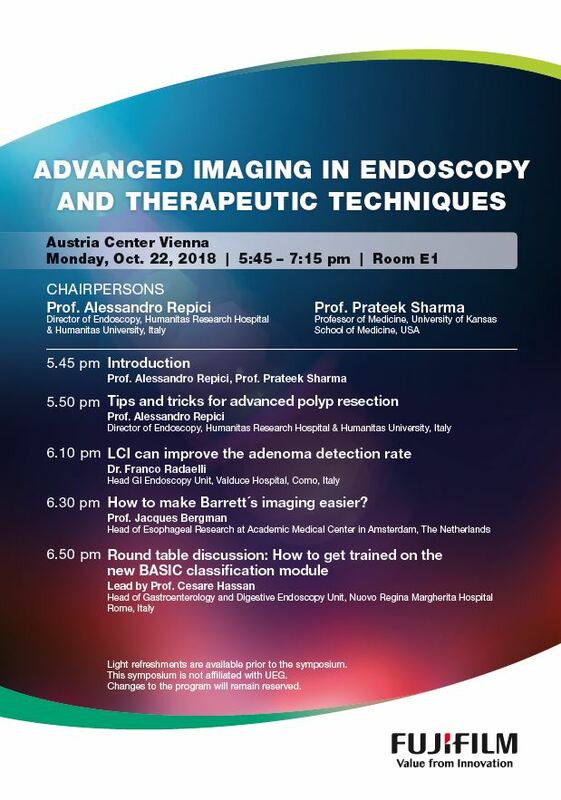 Join the Satellite symposium “Advanced Imaging in Endoscopy and Therapeutic Techniques” with the chairpersons Prof. Alessandro Repici (Italy) and Prof. Prateek Sharma (USA) on October 22nd during UEG Week 2018. The 26th UEG Week 2018, organized by the Society of United European Gastroenterology, is the largest and most prestigious GI meeting in Europe and takes place on Oct. 20 – 24 in Vienna, Austria. Together, the member societies represent more than 25,000 specialists from every field in gastroenterology. This makes UEG the most comprehensive organisation of its kind in the world, and a unique platform for collaboration and the exchange of knowledge.